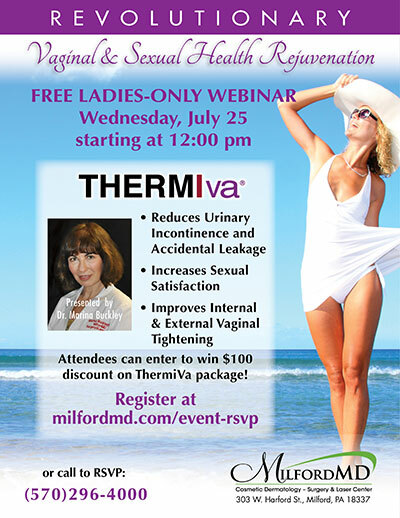 On Wednesday, July 25, MilfordMD Cosmetic Dermatology Surgery & Laser Center in Milford, PA, will host a webinar presentation introducing the ThermiVa technology for nonsurgical vaginal rejuvenation. The webinar presentation is from 12 p.m. to 1 p.m., it’s open to the public and those who attend can be entered to win a $100 discount towards their ThermiVa package purchase. On Wednesday, July 25, Dr. Marina Buckley, President of Pocono Medical Care, Inc., which offers cosmetic services as MilfordMD Cosmetic Dermatology Surgery & Laser Center in Milford, Penn., will host a webinar presentation and Q&A session introducing the ThermiVa technology for nonsurgical vaginal rejuvenation. The one-hour webinar presentation, from 12 p.m. to 1 p.m., is complimentary and open to the public. Those who attend can be entered to win a $100 discount towards their ThermiVa package purchase. Join MilfordMD for a lunch-time ladies-only webinar on vaginal & sexual health rejuvenation, where Dr. Marina Buckley will explain why ThermiVa has earned over 90% “worth it” ratings on RealSelf. “We get calls and emails every day asking about the new radiofrequency technology that tightens vaginal tissue without surgery. This is a great (and free) opportunity for women who are concerned with the look and function of their vaginal area to ask questions and learn about one of today’s hottest treatments,” says cosmetic surgeon and MilfordMD Medical Director, Dr. Richard Buckley. ThermiVa is the latest generation temperature controlled radiofrequency system for in-office, non-surgical anti-aging intimate makeovers. Radiofrequency Thermi devices are tried and true technologies used for skin tightening and rejuvenation of other areas of the body and face. “ThermiVa is among the nonsurgical and minimally invasive devices available at MilfordMD to address just about every cosmetic concern—from head to toe. ThermiVa, in particular, helps women reclaim their pre-baby bodies and restore sexual satisfaction,” says Dr. Marina Buckley. ThermiVa treatment safely, effectively, comfortably, without anesthesia or downtime addresses not only aesthetic, but also functional quality-of-life issues women encounter. The technology does this by delivering radiofrequency energy to specific areas, including the external labia and internal vaginal areas. In three in-office treatments, performed once a month over a three-month period, Dr. Marina Buckley can address aging-related loss of collagen and loose, hanging tissue. The technology treats the vulvolaxity and dryness, internally and externally, that can occur from vaginal birth. And it helps to treat pelvic organ prolapse, tissue stretching and nerve impairment, which can inhibit sexual satisfaction and well-being. “This technology has truly revolutionized an area of cosmetic medicine that hasn’t been tapped until now. Sure, there are surgical options for tightening and reshaping the vaginal area. And those options are good ones for women who are willing to go under the knife. But surgery just isn’t in the picture for many of today’s on-the-go young moms and professional women. Now, they, too, have an option in vaginal rejuvenation that will give them results on their time,” Dr. Buckley says. ThermiVa webinar attendees qualify for a free consultation, valued at $150, as well as an entry to win a $100 discount towards a ThermiVa package. To register for the upcoming MilfordMD webinar presentation on ThermiVa, visit https://milfordmd.com/event-rsvp/ or call MilfordMD Cosmetic Dermatology Surgery & Laser Center at (570)296-4000.